You can edit the coverage table that is attached to an insurance plan. A coverage table references what procedures a carrier covers and at what percentage. Along with deductibles and benefits, a coverage table allows for accurate insurance estimates. 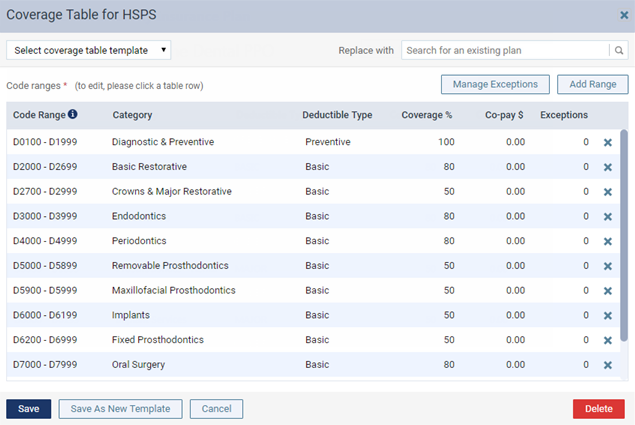 Tip: You can also replace the coverage table of any given insurance plan with the coverage table from any other plan or from a coverage table template. Use the Patient Search field to access a patient's record. If the last patient record you accessed since you last logged on is the correct patient's record, you do not need to re-enter the patient's name in the Patient Search field. From the Patient menu, under General, clicktap Overview. The patient's Overview page opens. In the Insurance box, clicktap an insurance Plan link. From the Patient menu, under Insurance, clicktap Insurance Information. The patient's Insurance Information page opens. ClickTap an insurance plan. From the Home menu, under Insurance, clicktap Carriers. While viewing an insurance plan that is attached to a patient's record, clicktap Coverage Table. While viewing an insurance plan that is associated with a specific insurance carrier, clicktap Coverage Table. If necessary, you can replace the coverage table with that of a template or another plan, or you can delete the coverage table to make a new one from scratch (not recommended). ClickTap Add Range to add a procedure code range, or select an existing range to edit that range. Note: When you change a range and then clicktap somewhere else, the text of the range that you modified turns bold. Also, any ranges that overlap or that are invalid become highlighted in red, and you cannot save the changes to the coverage table until those errors are resolved. To delete a range, clicktap that range's Remove button , and then clicktap Delete on the confirmation message that appears. To add, edit, or delete exceptions to the coverage for specific procedures, clicktap Exceptions. 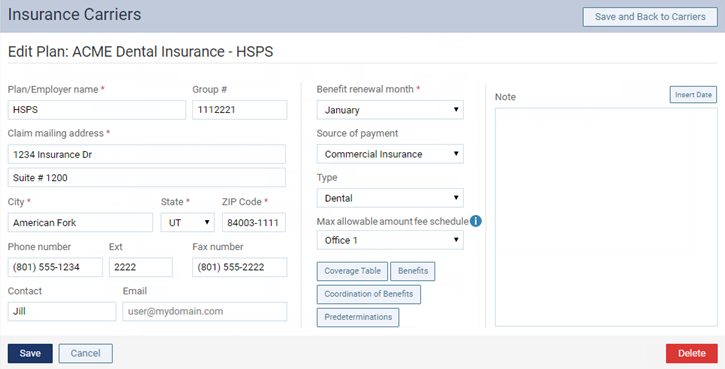 To apply the changes to the coverage table and create a new coverage table template using the specified coverage options, clicktap Save As New Template. In the New Coverage Table Template dialog box that appears, type a name for the template, and then clicktap Save. To apply the changes to the coverage table, clicktap Save.